It feels like we have been waiting forever for Guardians of the Galaxy, but that wait is coming to an end in just a few short weeks. The beginning of next month will also mark the official roll-out of the new Marvel Studios film, and – as we’ve been saying for months – we couldn’t be more excited. Those feeling a little impatient, however, were given the opportunity this evening to watch a full 17-minutes of the finished film. And it’s blowing audiences away. Our own David Wharton from our sci-fi sister site Giant Freakin Robot went to his local theater earlier this evening and was treated to multiple scenes of what looks to be one of the best films released in summer 2014. He’s given us a full rundown of what transpired in the footage, which begins with booking footage that was featured in the movie’s teaser trailer. What’s different about the scene this time is that the introductions are much longer – similar to what we saw at San Diego Comic-Con last year. For example, Gamora (Zoe Saldana) and Nebula (Karen Gillan) are both revealed to be daughters of Thanos, the big bad purple dude from the first end-credits scene in The Avengers. They have been loaned out to Ronan The Accuser (Lee Pace) for a mission, but that just puts them on a collision course with the rest of the ensemble. From there, the footage moved to the Kyln, an absolutely gigantic space prison, where the main characters begin to learn that they all have interesting connections to each other. Peter "Star-Lord" Quill (Chris Pratt) has stolen the orb that Gamora and Nebula were sent to recover, but Gamora claims that she was never going to give it over to Ronan. Rocket and Groot, meanwhile, are bounty hunters who have been searching all over the galaxy for Quill. Drax, meanwhile, is an inmate who makes a deal with the other future Guardians to break out of prison and go after Thanos. In the midst of this get-together in a common area, a big blue alien inmate approaches Quill and gives him the typical prison shpiel about being new meat and belonging to him. Groot steps up, sticks two fingers into the blue guy’s nostrils, and proceeds to grow the branches on his arm, lifting the guy off the ground. Rocket then announces both to the guy and everyone else in the room that Quill is their booty (finally explaining that weird first line of dialogue we heard months back). Cut to plan-making time – which takes place almost immediately after their incarceration. Rocket is the brains of the operation, and explaining to everybody how the plan is going to work. While the Raccoon explains all of the various things they will need to break into the security room, we see Groot in the background picking up said supplies. 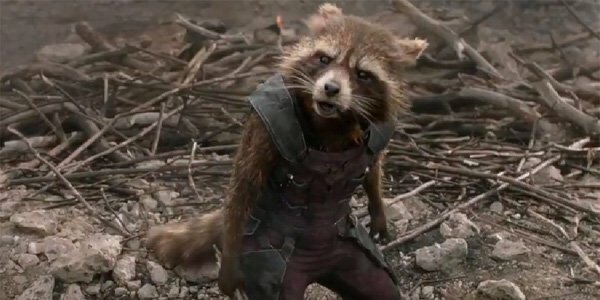 Finally Rocket talks about needing to grab a battery, which Groot does – but then Rocket further explains that it "will set off alarms so we have to get that last." From that point there is a big action sequence that plays out, allowing all of the main characters a moment to shine. Rocket eventually shuts down all of the gravity, opening up the chance for escape, but at the last second the Guardians find themselves trapped behind a door that has just slammed shut. To touch on the little details, David said that there is a surprising amount of range in Vin Diesel’s limited dialogue (his character can only say "I am Groot"), and that the CGI looks "AMAZING." He also praised Bradley Cooper’s voice acting for Rocket, noting that it’s just different enough from Cooper’s natural timbre that it’s not distracting. Drax reportedly speaks in Game of Thrones-esque English, but also comes from a culture that doesn’t use metaphor (leading to a funny scene where Star-Lord calls him a "thesaurus"). This has gotten me only more excited to see Guardians Of The Galaxy, and I’m glad the wait is down to just a little over three weeks. Look for it in theaters on August 1st.